Manama, Bahrain / New York, United States – BIBF, Bahrain’s pre-eminent business training provider, has partnered with DinarStandard, a New York based growth strategy research and advisory firm with core experiences in Halal economy sectors, to offer a ground-breaking training course on the convergence of Islamic Capital and Halal Food and Muslim Lifestyle sectors. Islamic capital continues to seek new growth opportunities, however there is very limited engagement with the related Halal economy sectors. This is starting to change and various entities are starting to look at the Halal food space especially. There is a growing need to develop Islamic finance professionals’ understanding of this opportunity and how to best leverage it across the suite of Islamic Finance offerings from investments, operating capital, takaful, trade financing and other major business financing needs. The burgeoning Halal food and Muslim Lifestyle sectors is estimated to be worth $2 trillion in 2013, and is expected to reach $3.74 trillion by 2019, based on the State of the Global Islamic Economy 2014/2015 report, produced by Thomson Reuters in collaboration with DinarStandard. This represents a huge opportunity for Islamic Finance, which has been for the most part untapped. Strategic investments on the part of sharia-compliant Private Equity firms in Halal food and lifestyle related businesses, trade financing, working capital financing, mergers and acquisitions, sukuk issuance, takaful, etc. are just some of the ways Islamic Finance can capitalize on the growth of these sectors. Bahrain is well positioned to leverage its positioning as a regional financial hub with a well-developed banking sector and a growing Islamic finance industry to create an impact in the Halal economy sectors; especially given that it has a well diversified economy that does not heavily rely on the oil and gas sector. Finance, tourism and industrial manufacturing play a strong role in its economy. With growing competitiveness from the region, a key growth opportunity for its already robust Islamic finance sector, is the emerging global Halal economy space. 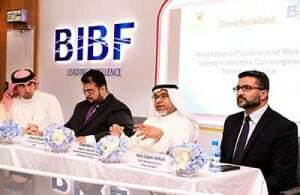 While the potential of Islamic finance sectors are being realized, a key area BIBF has led in, it is the Halal food and lifestyle sectors with their significant potential size. The ground-breaking “Convergence of Halal Economy and Islamic Capital” training course is a managerial level course tailored for Islamic Finance and Takaful executives and managers. The course will give participants a summary of the Halal market opportunity and focus on specific areas of financing/ takaful needs and gaps by the key Halal economy sectors of food, pharma, personal care, travel and fashion. Specific focus will be on the Halal food value chain opportunities. The course covers the six-core Halal economy sectors beyond Islamic finance. These sectors covered include Halal food, Family tourism, clothing/fashion, media/recreation, pharmaceuticals, and cosmetics, and outlines their geographic and market potential profile. This course will be delivered at BIBF in May 2015.